I collect vintage G.I. Joes, the 12 inch ones. However, I needed additional figures that had different features. 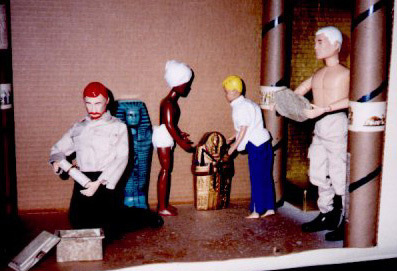 I looked up Cottswold's Collectibles on the net, and they make figures just like the vintage G.I. Joes, but with several different "heads" to choose from. The Dr. Quest figure already had a moustache and goatee, but I had to re-paint his hair red and add the beard. The Race figure had blond hair, and I just painted his white. 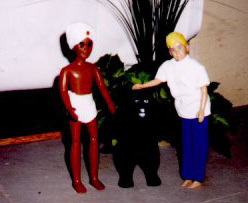 The Jonny figure is from Barbie, and I happened across the Hadji figure at an antique store. The Mummy scene is still a work in progress, and not nearly half done. I'll work on that more this year. I'm also working on a red shirt for Race, and am always thinking of more outfits and scenes as time permits. 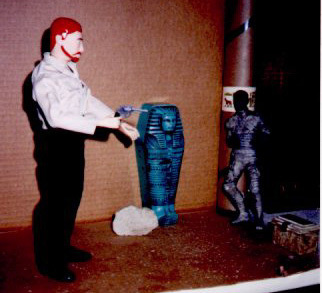 Two photos showing scenes based on "The Curse of Anubis". 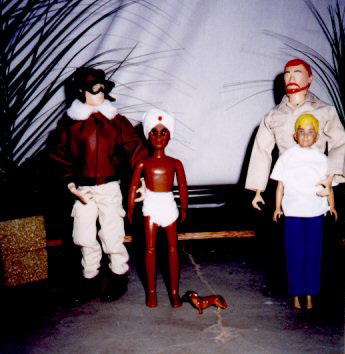 A scene inspired by "Attack of the Tree People". Two photos from "Shadow of the Condor".